Hi everyone, I wasn't trying to hold out on you. I'm not that mean. Just been busy moving. Dude! Ya'll should so appreciate me because I believe in sharing my recipes in an effort to get everyone to love Vietnamese food. 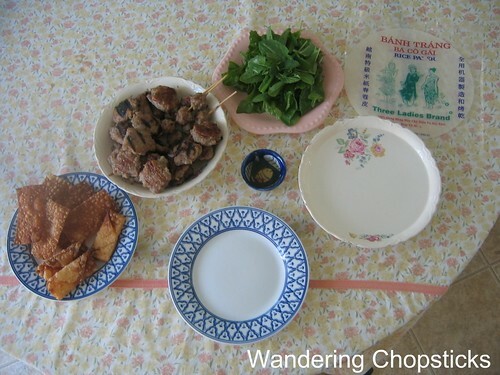 Anyway, a while back one of my readers had emailed me requesting a recipe to go with banh trang (Vietnamese rice paper). I pretty much wrap everything in banh trang. Sometimes, I just roll the banh trang plain and dip it in Mam Ruoc (Vietnamese Fermented Shrimp Paste). Mmm. But there are certain grilled meats that signal spring to me. And since I've got a nice little batch of herbs from my garden, I decided to make nem nuong (Vietnamese grilled pork patty). Nem is the ground pork. Nuong is grilled. As I've mentioned before, we South-Central Coast Vietnamese like to put a little bit of crunch in our nem nuong rolls. 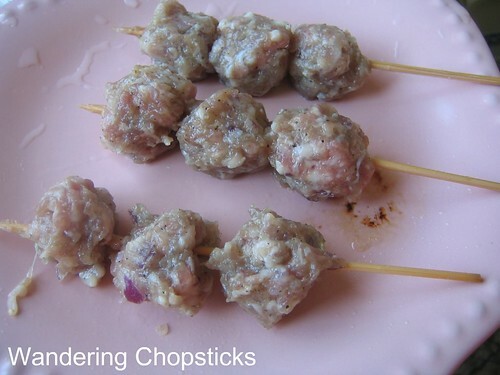 Some versions of nem nuong include color and cornstarch and baking powder for a pink and bouncy meat. I've never been a fan of that texture. 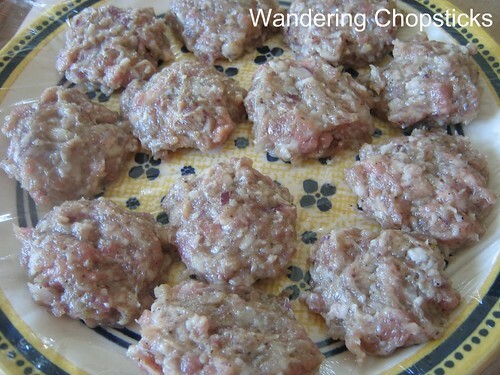 This recipe is closer to how my mom made it, like mini-hamburger patties. Optional: Substitute honey for the sugar if you want a better aroma and flavor, but sugar works just fine. Also, you can add 1 tblsp cornstarch if you want the meat to have a firmer consistency. This amount makes about 24 patties of 2 inches round, 1/2 inch thick. Plan on 2 patties per roll, 3 rolls per person. Or more, obviously, if you've got a bigger appetite than mine. Now, most recipes don't include the almost liquified onion. Most Vietnamese rely on the fat in the pork to give the nem nuong its juiciness. My mom prefers to grind her own pork so that she can cut down a lot of the fat. The onion injects the juiciness back in. I think it also adds a lot of flavor. 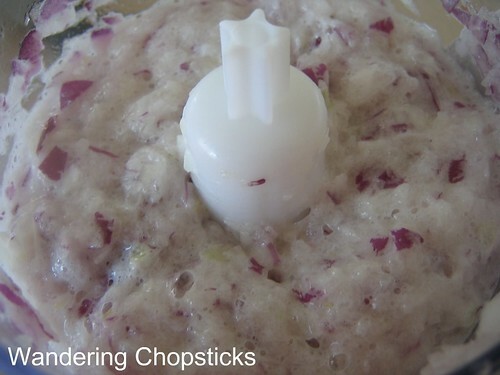 You don't want to actually encounter any little onion pieces so puree it as fine as possible. If you actually want really firm patties though, you'll want to grind your own pork and omit the onions. Mix all ingredients together. Then take a tiny piece and pop it in the microwave for about 30 seconds or so until it is fully cooked. Taste and adjust if necessary. The meat should be savory, but slightly sweet as well. The onions will have released liquid, just press down on the meat and tilt the bowl to let the excess liquid drain out. I prefer to shape mine into patties roughly 2 inches in diameter and about 1/2 inch thick. This is the ideal size for cooking quickly on the grill or in my little George Foreman grill. Guests then only have to break them in half in order to roll them up in rice paper. And in a pinch, you can also pan-fry them. When I'm making a lot at once, instead of piling them all on multiple plates, I just layer plastic wrap in between for easier removal. If the meat becomes a little too sticky to work with, you can either oil your hands before touching the meat or wash frequently between batches. 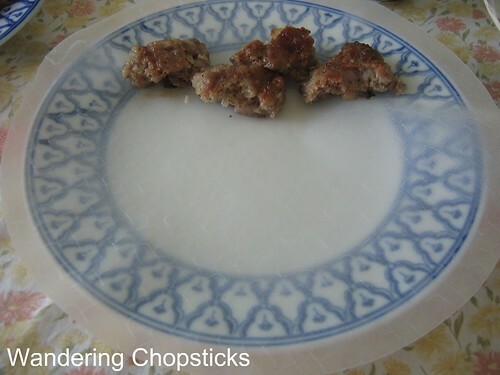 Sometimes it helps to put the plate of formed pork patties in the freezer to retain their shape before pan-frying or grilling. 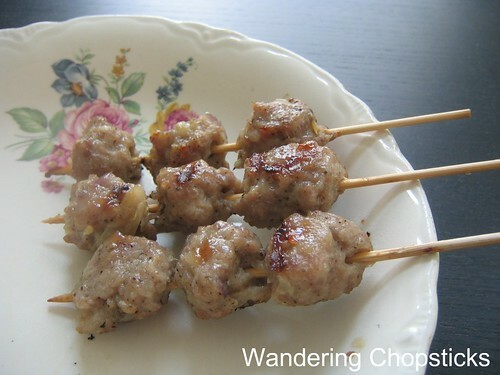 You can also shape them into balls and put them on skewers if you plan to serve these as appetizers. Or form a long patty like a kefta kebab around the skewer and slice afterward. 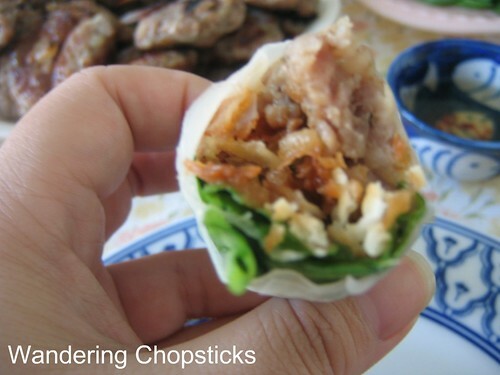 Grill the pork patties and serve on a plate so everyone can make their own rice paper rolls. 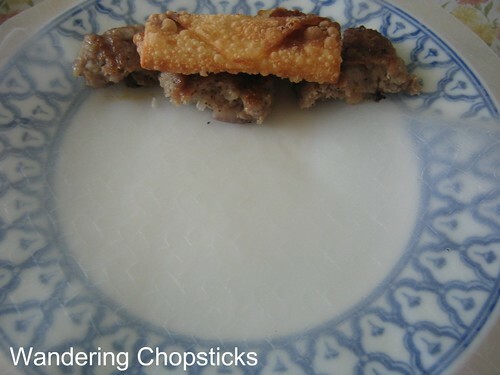 For the egg roll wrapper: Cut in half and fold as normal. 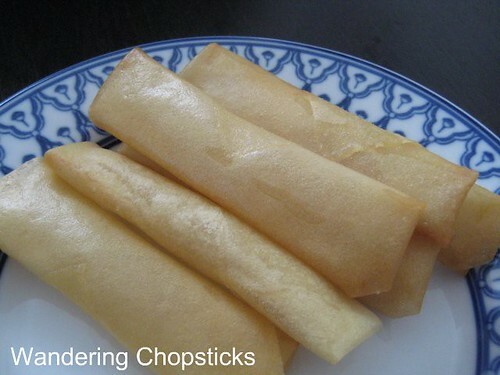 Just make like you're folding egg rolls, but without any stuffing. A plate of herbs: I've got green leaf lettuce, spearmint, apple mint, and sorrel. It's up to your personal preference. If you don't have access to any herbs, a baby greens salad mix would serve as a decent substitute. Or just lettuce alone, but you kinda want a variety of herby tastes and plain lettuce is just bland, ya know? You can also add slices of cucumbers or green apples for crunch. 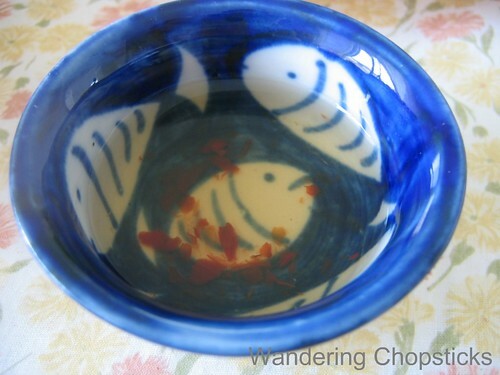 Dipping sauce: Follow my instructions for Nuoc Mam Cham (Vietnamese Fish Dipping Sauce). I make my fish sauce in a big enough batch to fill a jar and leave it in my fridge so I don't have precise measurements. On low heat on your stovetop, melt a few tablespoons of sugar into a mix of 1/3 vinegar, 1/3 fish sauce, and 1/3 water. When the sugar dissolves, taste and add more if needed. Yes, this will stink up your kitchen so open your windows wide, or invest in an air purifier. Add a little bit of corn starch if you want a thicker consistency. Add the minced chili and garlic after the fish sauce is to your liking. It should be on the sweet side. Save in a glass jar in the fridge and it should last forever. Serve this with crushed peanuts. I'm not a peanut fan so I don't put it in mine. Squeeze in a fresh lime or lemon for freshness when serving. Or you can also beat in an egg ala egg drop soup style and some hoisin sauce or smooth peanut butter if you want a Brodard-like sauce. The egg though doesn't keep as well so only do this in small batches if you intend to use up all the dipping sauce. 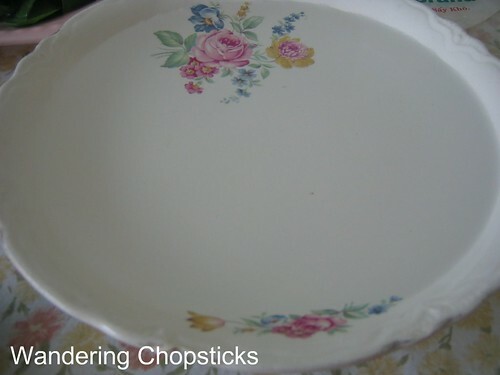 A bowl of water: For dipping the rice paper. To serve, you'll want a plate of the nem nuong, egg roll wrapper, herbs, banh trang, a bowl of water for that banh trang, an empty plate to wrap the rolls, and a dipping sauce bowl. Follow my primer on how to wrap rice paper if you don't know how. You should just wet, but not soak, the rice paper in the bowl of water. 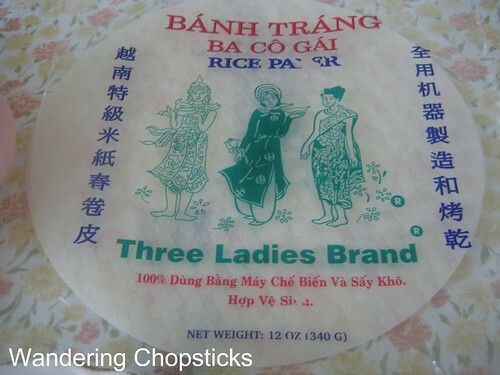 The rice paper will become pliable as you're making the roll. Break the patties in half and line them into a row. Then add a fried egg roll shell. Then as you're rolling make sure you have a tight roll so nothing falls out when you're dipping and eating. This recipe has consistently done well for me. I don't make them very often because my aunt caters and I usually get a batch of hers for free. :) We sold out every year I made these for the Vietnamese Student Association at my college's International Festival. So you will still be giving us the recipe, don't you? It was just a joke right? Yummy patties! Are you teasing us ,WC??? Though you can't give out your secert recipe....'cause it won't be a secret anymore, right? haha :D it looks good. Anyways, that looks REALLY good!! Those pictures actually made my salivary glands kick into gear! Posting pictures so delicious I want to eat them, with no recipe. Really, pretty please with sugar on top, just the recipe for the first picture??? Sweet sassy mollasey! That looks awesome. Forget the recipe, can you just bring some to the next blogger outing? HAHA! So, do you know what's in Brodard's pink sauce? 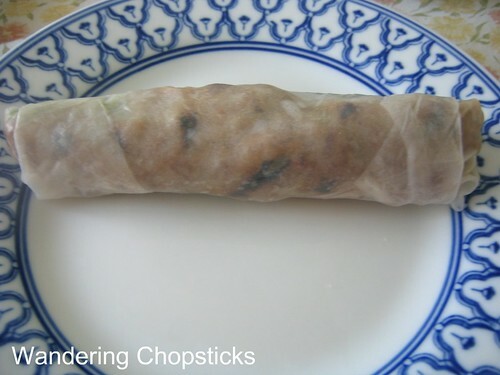 I have found that rolling pretty much anything in rice paper and dipping in nuoc mam (aka "cham") is tops. The post-Thanksgiving turkey proved that to me. Ooo, just came across your blog! What's the fried stuff in the 4th photo down? That looks like a nice calorie-ladden snack! Thanks for the recipe WC. 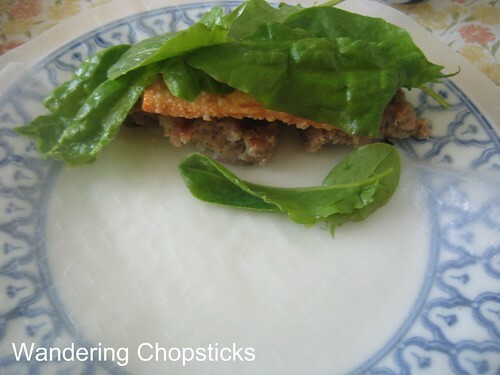 Adding the egg roll wrapper is a good idea ... will definately try it!!! Finally got around to try out the recipe. IT IS TO DIE FOR!!! My goodness! It's simply, absolutely delicious! I used a grater to grate the onions over the meat. I think it made the meat more moist and juicy. This is definately a keeper!! Thanks a bunch for sharing!!! I think my recipe is flavorful enough that you don't have to have the dipping sauce if you're serving it for your Superbowl party. For pork chops, I'd suggest my recipe for basic marinade for Vietnamese porkchops and chicken on the bone. For chicken cutlet, you can try my lemongrass chicken recipe. You can search for both recipes or look under the recipe list. thanks for the recipe!!! I can't wait to make it. I was going through some of your recipes. There's a restaurant around the corner that makes excellent nem nuong. I'll try to get Cathy to go! Unfortunately, they simply serve it with bun and don't roll it! We like crunch with this too and roll with the ram tom (what you call nem ram?). We also eat it with bottled Thai chili sauce - my mom says it's similar to a chili sauce they serve in Quang Ngai. You mean cha ram? Nem ran is Northern speak for cha gio. :) I made bap ram the other day. Will have to post about it soon. It was yummy! I mean the ones with just shrimp in it. Can't wait to see the post! Thanks for reminding me. Will have to post the recipe soon. 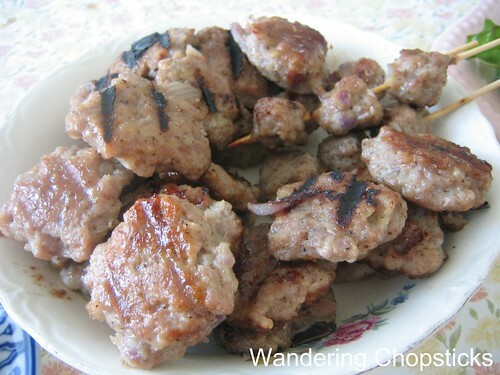 My version of nem nuong is the same grilled ground pork as you see in bun cha. The other version of nem nuong, the pink kind that's firmer, uses food coloring and starch to achieve that consistency. I prefer not to add color or starch to my meat. Patties may be shaped however you wish. 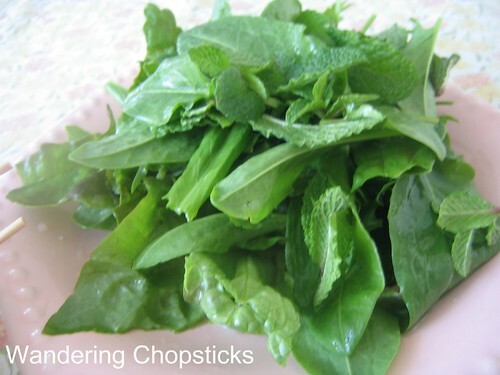 The nuoc cham recipe is also listed above in this post. Looks yummy, thanks sooo much for sharing! You're welcome! Hope you try the recipe.